Annika and Rory took a tour to the Masca Gorge, north of Los Gigantes. They hiked in a group with guide from the village of Masca about 600 metres down through the gorge to the sea. After a swim in Masca Bay, a boat took them back to Los Gigantes. On the way they saw some dolphins and had a meal of paella. The bus then took them back to Puerto de la Cruz. The road to Masca is on the right. On the left you can see the village of Masca, perched on the ridge. The village of Masca, starting point of the hike down the gorge to the sea. Near the top of the trail. A lava tube along the way. The trail down through the gorge. That is Annika making her way down. The gorge is very narrow in places. Annika at the foot of the gorge. After a swim in Masca Bay a boat trip back to Los Gigantes. Saw some dolphins along the way and had a meal of paella. 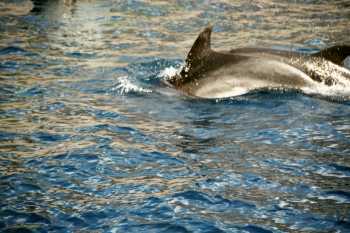 A pair of dolphins on the way back to Los Gigantes.